Students who major in mechanical engineering will be the people designing the transportation systems, consumer goods, factory equipment and the automated systems of today and tomorrow. In classrooms and laboratories, you'll study ways to test and improve the tools, machines and systems used in production. Mechanical engineers work in almost every industry from transportation to medicine to space exploration. You'll learn math, science and engineering principles, and you'll use them in laboratory work and in fieldwork alongside experts already working in the field. Your senior project will challenge you to solve problems in a real-world setting under real-world conditions. Courses taught by faculty with extensive industrial experience, many with professional engineering licenses. Faculty expertise in controls and robotics, production management, processes, automation, quality engineering, computer-aided design and lean manufacturing. Senior design projects that are company-funded and include a company engineer on the team. Students build real-world experience with budgets, objectives and deadlines. Opportunity to innovate and create new manufacturing strategies, systems and facilities. Senior projects that sometimes result in patents and/or professional presentations. Students often secure a job before graduation, sometimes with companies that funded the student's senior design project. Students eligible to apply for one of 45 National Science Foundation STEM scholarships, a two-year grant that includes a $12,000 stipend. The 100,000 sq. ft. state-of-the-art Integrated Science and Engineering Laboratory Facility (ISELF) offers collaborative hands-on work areas for science, technology, engineering, mathematics (STEM) majors for real-world experiences. 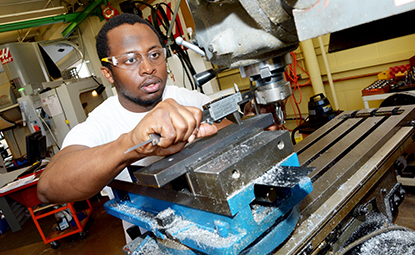 One of five mechanical engineering programs in Minnesota accredited by the Engineering Accreditation Commission of ABET, the nation's only accreditation agency for engineering programs. Engineering students and faculty worked with utility Xcel Energy to design and produce a battery-operated foldable electric scooter that engineers and technicians could use to inspect 6- to 7-feet diameter concrete drainage tubes.